Because if you don't know, then you might get hit with unexpected taxes and/or penalties. In order to insure this doesn't happen to you, you need to make sure your Roth IRA withdrawals are "qualified distributions." In order to make sure your withdrawals are qualified distributions, make sure you follow the Roth IRA withdrawal rules. Commit these Roth IRA rules for withdrawal to memory, and you'll know just about everything you ever need to know about withdrawing funds from your Roth IRA. 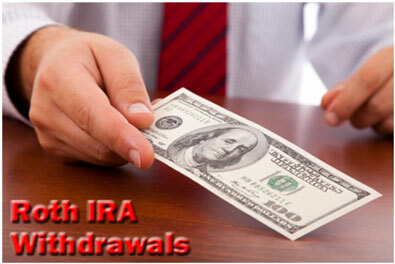 Withdrawals from your Roth IRA must follow certain rules established by the IRS. Principal contributions are never subject to income taxes or early withdrawal penalties, because you made those contributions with after-tax dollars. However, if you're under age 59 ½ or haven't met the requirements of the 5 year rule yet, then your other Roth IRA withdrawals may be subject to income taxes and/or a 10% early withdrawal penalty. So these rules are important. Unlike a Traditional IRA, you can withdraw funds from your Roth IRA tax-free and penalty-free as long as you're withdrawing an amount equal to or less than your original contribution. Well, it is your money. And since you funded your Roth IRA with after-tax income, you've already paid income tax on it. So you don't need to worry about incurring penalties or taxes when you make Roth IRA principal withdrawals. But you DO have to worry about taxes and penalties if you withdraw the earnings or gains that resulted from your original principal contribution. For example, let's say you contribute $5,000 to your Roth IRA one year. The next year, you decide you need that $5,000 after all. But the $5,000 is now worth $5,500 because your investment gained 10% during the year. You can withdraw the original $5,000, and it won't cost you a penny, because Roth IRA contribution withdrawals are tax-free and penalty-free. But if you withdraw the $500 gain, it's subject to an early withdrawal penalty of 10% as well as income taxes. As previously mentioned, if you withdraw a principal contribution from your Roth IRA, it's always tax-free and penalty-free. However, the same can not be said when it comes to withdrawal of investment gains from your Roth IRA. Age 59 ½ is the effective Roth IRA early withdrawal deadline. Most withdrawals prior to this age will trigger income taxes and an early withdrawal penalty. If you don't meet the IRS requirements for a qualified distribution, you will probably incur a Roth IRA withdrawal tax. This usually comes in the form of income taxes and/or a 10% early withdrawal penalty. Whether or not you're subject to these taxes or not depends on your age and the age of your account. But, as a general rule, any withdrawal of a Roth IRA investment gain made prior to age 59 ½ is subject to both. Let's say you open a Roth IRA and contribute $4,000 in the first year. But the original $4,000 contribution you made is now worth $6,000 due to a 50% investment gain. You can withdraw the original $4,000 contribution tax-free and penalty-free. A 10% early withdrawal penalty and income taxes. Assuming a 35% income tax rate, you owe income taxes of $700. Your 10% early withdrawal penalty is $200. The Roth IRA withdrawal age at which you can make tax-free, penalty-free Roth IRA distributions is age 59 ½. You can withdraw investment gains from your Roth IRA tax-free and penalty-free. For example, let's say at the age of 30, you invested $5,000 in your Roth IRA and never made another contribution. At age 60, your Roth IRA is worth $20,000. Since you're older than age 59 ½, you can withdraw every penny of that $20,000 tax-free and penalty-free. However, this assumes your Roth IRA meets the 5 year tax holding period. In order to withdraw investment gains from your Roth IRA tax-free and penalty, even after the age of 59 ½, your original contribution or Roth IRA conversion must have taken place at least five tax years prior to the withdrawal. For example, let's say you opened a Roth IRA in 2007 at age 58 and contributed $5,000. In 2009, even though you're 60 years old, you can NOT withdraw any of the investment gains on the original $5,000 contribution without paying taxes. Because your Roth IRA has not yet met the five-year tax holding period, which is a sort of Roth IRA early withdrawal deadline. Instead, you'll have to wait until January 2012 before you can withdraw investment gains tax-free and penalty-free. Because 5 tax years will have passed by then. 2007... 2008... 2009... 2010... and 2011. Make sure you remember that the rule applies to the tax year, not the actual year. Because you have until the April 15 tax deadline to make a contribution to your Roth IRA. So, for sake of argument, let's say you make a $2,000 Roth IRA contribution for the 2008 tax year on April 1, 2009. Your five-year holding period begins ticking in 2008 not 2009, because 2008 is the actual tax year of the contribution. Before the 5-year tax holding period ends. Then, you're subject to income taxes and a possible 10% early withdrawal penalty. However, certain exceptions do exist, such as Roth IRA withdrawals for the disabled and Roth IRA withdrawals for the unemployed. However, keep in mind that these are rare exceptions. Make sure you consult your accountant before taking advantage of any one of these exceptions.